…on such a winter’s day. Actually winter has been unusually pleasant this year and I’m sure it will soon punish me for saying that. We traveled to California in September for a wedding and a few days vacation and I just couldn’t get the blog restarted when we got back. But not because I don’t have anything wonderful to report – I do! We have happy memories of the trip – lots of fabulous food, wine, beer, cider (is there a theme here?) and even some plant-related tourist stops. More about those later. 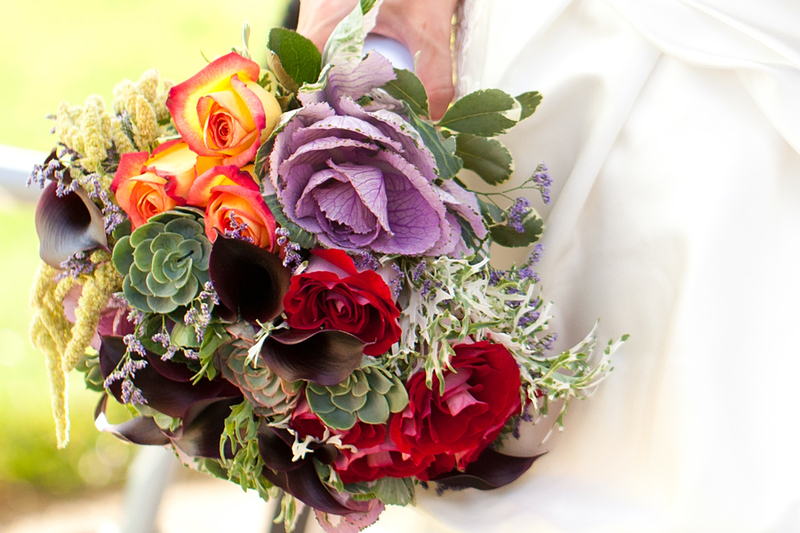 This post is about the beautiful bride’s interesting, lovely, and sentimental bouquet. And so interesting upon closer observation. How many wedding bouquets have you seen that feature cabbage, kale, and succulents? And garden flowers like Love-Lies-Bleeding (Amaranthus caudatus)? As a person who is expected to know something about plants, I often get asked to identify things. So when someone inquired what was that turquoise flower in the bouquet, I was stumped by the question because 1) I didn’t notice any turquoise flowers, and 2). I can’t think of any turquoise flowers. But my reputation may still be intact because it wasn’t a flower and only sort of turquoise – leafy gray/blue/green (does that color have a name?) rosettes of some succulent which I’m guessing is an Echeveria. Anybody want to help me out here? However, I was truly stumped by the cabbage and kale. The brain is expecting flowers and it will find them even if they aren’t there. Here’s a better view of the cabbage (top right) and fringy kale (just below and to the right of the cabbage). But I think the sentiment behind some of the choices is the nicest of all. Callas and cabbages were two prominent and fondly remembered plants in the bride’s grandmother’s garden. Everything you ever wanted to know about the song “California Dreamin'”, courtesy of NPR. 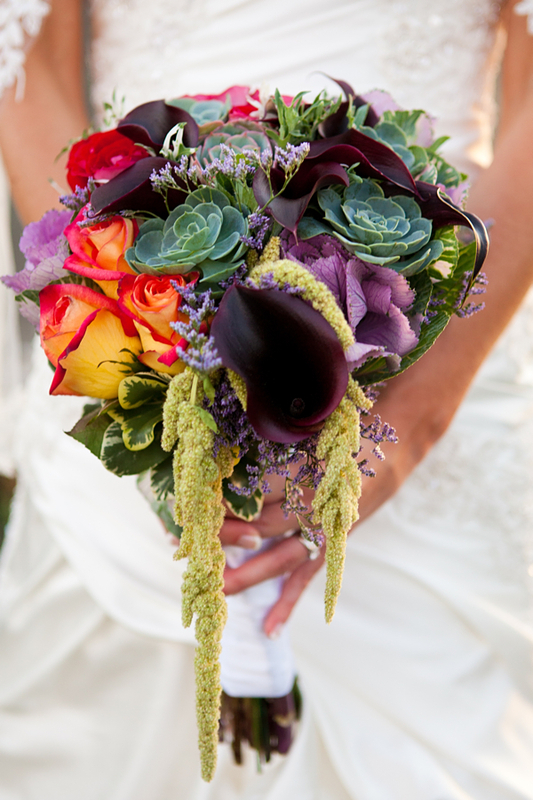 I love the use of succulents in the bouquet – very different. Your garden pictures from Northern Virginia have me feeling nostalgic for our time there. These days I’m in Southern California looking for interesting drought tolerant plants.